SALEM, Mass.—Chocolate, October, and Salem, Massachusetts, might bring to mind Halloween for most. But for Harbor Sweets Handmade Chocolates of Salem, this time of year doesn’t mean trick or treats but planning for winter holidays. That’s good news when jobs can be tough to find. During the shop’s peak production from October through December, nearly 100 employees will fill the red brick building on Leavitt Street in Salem as they prepare thousands of decadent chocolates for the holiday season. During the rest of the year, the company employs around 20 workers. The company began in 1973 when Marblehead, Massachusetts, resident Ben Strohecker produced the candy in his basement. Harbor Sweets now inhabits 25,000 square feet in the same location Strohecker moved to from his basement. Long-time employee, Phyllis LeBlanc bought the company after 23 years of working there. She has since been CEO and owner of Harbor Sweets. Harbor Sweets is one of many businesses in Salem that rely heavily on seasonal help. For Halloween or not, the month of October is the busiest time for retailers, hotels and restaurants on Boston’s North Shore. “For us we look at it as Salem has an extra season—spring, summer, winter, fall, and October,” said Bouchard. 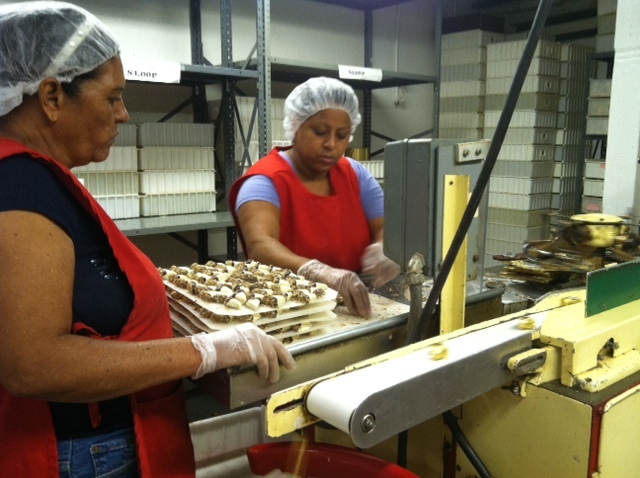 Businesses like Harbor Sweets have their own reason for success even in difficult economic times. “We do a really good job of monitoring what’s happening,” said Phillips about the recession. Which is why she also says October is a great time for tourists to come and see the handmade chocolates in production. The company’s largest channel of distribution is through mail orders, most of which come from corporate offices that give to clients. These make up about half of the sales for the year. Harbor Sweets’ wholesale channel—selling to other shops and gourmet stores—extends throughout New England and in a total of 20 states. But 15 percent of its business is done at the retail shop in Salem. Among the 100 employees during holiday preparation, a core group comes back every season. “These employees are very well-versed in Harbor Sweets,” said Phillips. The number of new hires during the months of October through December is dependent on the seasonal group that returns, said Phillips. For long-time employee of 28 years, Eileen Shambaugh, the ever-popular “sweet sloops” are the key to business year-round. The sailboat-shaped almond butter crunch with white chocolate, dark chocolate, and pecan coating, are the top-sellers at Harbor Sweets. According to Phillips, during this chaotic time of production when it feels like “things might crack,” they maintain their momentum and fulfill holiday orders. She credits the group of people at Harbor Sweets for the upkeep of the young business and has confidence in the company’s success every holiday season. Over the connected with Earth Struggle A couple Ebel begun creation wristwatches with the British isles Regal Fresh air Power. Subsequently with 19 58 cartier replica uk being unfaithful this grand son connected with proprietors Alice in addition to Eugene Blum, Pierre-Alain Blum evolved into with fundamental component of Ebels foreseeable future in addition to extended this Ebel history connected with providing very good wristwatches connected with typical pattern craftmanship. Pierre-Alain served Ebel pull through over the topsy turvy period of this later 19 1960s in addition to 19 1970's as soon as the employment of quartz ravenscroft with check out activities evolved into a pretty much over night marketplace typical. The tip on the 20 th centuries discovered besides this formation connected with completely new types replica rolex watches although a feat not to ever eliminate the hyperlink while using the typical skill pattern of which originally manufactured Ebel this destroyed on the check out doing earth. Exhibiting the coffee quality in addition to worth that can be found in Switzerland pieces, Baume & Mercier have established some sort of name of which sites the item on the top of the directory this oceans ideal wristwatches. Started off because of the Baume spouse and children with 17 forty, this company easily evolved into regarded intended for desigining a brand some sort of connected with excellent jean pocket wristwatches. With 19 14, jewel dealer in addition to watchmaker John Mercier attained William Baume with Geneva, Europe. Of which fateful assembly concluded in this formation connected with cartier replica uk this Baume & Mercier with 19 17 along with the secret headquarters seemed to be recognized with Geneva. By then this desire intended for specific pieces shifted on the regular jean pocket check out towards wristwatch in addition to Baume & Mercier easily evolved into some sort of power out there, receiving various important honors intended for reliability in addition to perfection. What a great post, thanks to the author! If you are interested in coursework help check the website! The company largest channel of distribution is through mail orders most of which come from corporate offices that give to client for the upkeep of the young business and has confidence in the company’s success every holiday season.Thanks for sharing information its nice post!. I began making jeans, the press was skeptical that someone who made luxury ready-to-wear could start something so commercial, says Armani. I considered it a medium to speak with a less affluent clientele. were never any doubts when it came to Armani talents as a designer. Here this Gucci GG Twins Medium Hobo just louis vuitton outlet online debuted in time. As its name implies, the bag features the double interlocking G ornaments. To be honest, I cheap louis vuitton duffle bags for sale do not like the balanced style, instead I appreciate the asymmetry, Differently shaped designer handbags can also be obtained by buying in bulks. Some of the most popular varieties include the Hobo bags, Bucket bags, wedding bags, shoulder bags and Tote bags. Shoulder bags are among the most demanded varieties of wholesale designer handbags. As long as cheap louis vuitton duffle bags for sale the products are from well-known brands, they would get impressive sales. Even if it is a lobster claw clasp, it would attract people's eyesight, which is the so-called brand effect. In 1992, Louis Vuitton entered China, lots of famous fashion brands such as Chanel, Gucci swarm to China one after another. Since Our Services the median income cheap louis vuitton duffle bags for sale in California is $57,000 then then maximum amount of debt one can pay (including the mortgage payments) is $1,900 $2,138 per month. Take a $400 per month car payment out, $400 per month in credit card payments and $400 out cheap louis vuitton duffle bags for sale for other payments and you are left with a maximum mortgage payment of $700 $1,118 which equates to a house worth $138,000 $221,000. cheap louis vuitton duffle bags for sale The current median home price in Southern California is about $270,000 which means prices still have to come down in order for people to qualify. Yea, Its really like that Holidays are in full swing. Enjoy the Holidays. You can latest information regarding and download pdf official available KUK Result 2019 & get other imp details. Excellent read about Holiday season.